The US Food Sovereignty Alliance calls for mobilizations for food sovereignty and food justice that put food producers – farmers, workers, urban gardeners, fishermen – back in control of their land and their food. (Check out the list of USFSA actions here: http://usfoodsovereigntyalliance.org/usfsa-takes-action-across-the-country-for-april-17-international-day-of-peasants-and-farmers-struggles/). 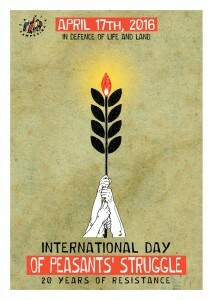 April 17th is an important day in the struggle for food sovereignty. Twenty years ago, 19 members of the Landless Workers Movement (MST) in Brazil were killed during a peaceful action to obtain land for farming and other livelihoods. In this moment, we recognize the violence and the criminalization of grassroots organizations and movements struggling for a better world. Resource extraction and industrial agriculture – and the corporate greed and free-market politics supporting them – threaten solutions to the many crises we face. On this day of Peasants’ and Farmers’ Struggles, we honor the lives and work of activists who have been oppressed or killed defending land, water, and indigenous rights against transnational corporate greed and state violence. We also honor the lives and work of activists who continue these struggles. On April 7th, MST members Vilmar Bordim and Leomar Bhorbak were killed in an attack by Brazil’s State Military Police and private security forces of the logging company Araupel, in an MST encampment on land that had been declared public by the Brazilian Justice Department. We honor their lives and struggle for land. We also remember the work of Berta Caceres, coordinator of the Civic Council of Popular and Indigenous Organizations of Honduras (COPINH), who was murdered in her home for protecting indigenous lands and waters from destruction and pollution. We also mourn the assassination of Bazooka Rhadebe, Chairperson of the Amadiba Crisis Committee in South Africa, for resisting mining projects on their ancestral lands. As members of the US Food Sovereignty Alliance (USFSA), we recognize that our current industrial food systems in the US are rooted in structural racism and colonization. We recognize the urgency and responsibility to confront the widespread influence of corporate agribusiness and transnational corporations, many of which are based in the United States. We reject this dominance by US corporations that often comes with political support for repressive and anti-democratic regimes. Within the US, we denounce the devastating policies that have exploited and repressed the working classes, people of color, native peoples, immigrants, and migrant laborers. We work to build solidarity with these communities in the US and across the world. The United States is now the epicenter of industrial agriculture, and many rural communities are struggling to hold on to their land, their livelihoods, and their health. Over the past 80 years, disastrous free market agribusiness policies that push prices far below a farmer’s cost of production, as well as the spread of monoculture forms of agriculture that require heavy use of pesticides and technology to be economically viable, have left roughly 2.1 million farms in the United States, down from 7 million in 1935. There are as many as 3 million landless farm workers in the United States who face poor wages and are denied basic labor and human rights. Moreover, as older farmers retire over the next 10-20 years, up to 400 million acres of land are expected to change hands, with corporate agribusiness and the banks and investment funds financing them just waiting to acquire it. The representation of the number of American Indian, Hispanic/Latino, Asian American and African-American farmers and ranchers shows remarkable resilience, growing at a faster rate than White farmers and ranchers (5%, 21%, 10% and 21% respectively, according to the USDA), and reversing earlier declines. Even so, these diverse groups combined operate only about 7% of the farms in the US, leaving 93% controlled by white operators. Additionally, even though 85% of fruits and vegetables are handpicked by millions of farm workers, the population of skilled farm workers, many of whom were farmers in their places of origin, forced out by bad policy in response to unfair trade deals, remain largely invisible. In urban spaces, after decades of “redlining” and a long history of institutionalized racism and segregation in American cities, communities of color have been left with little employment, few services, and very limited access to healthy food. Now, mega real-estate developers are buying up land in these cities, displacing communities and literally uprooting the gardens and urban farms that communities created to ensure that families could eat. The concentration of the commons into corporate hands extends beyond land to our waters as well. Fishermen are facing a rapid privatization and financialization of the fisheries as the “right to fish” is commodified and sold to the highest bidder, opening the floodgates to banks and corporations to buy up massive and exclusive control over the fisheries and the oceans. Members of the USFSA and the US Friends of the MST are organizing actions in Chicago on April 14th, Washington D.C. on April 15th, and New York City and San Francisco on April 18th, to push for food sovereignty and agrarian reform here and internationally, in solidarity with the social movements in Brazil and around the world. The US Food Sovereignty Alliance calls on its members and allies to organize demonstrations, public discussions and debates, film screenings, farmers’ markets festivals, and other actions of solidarity this April 17th. To share information about your action, email info@usfoodsovereigntyalliance.org, and to learn more, visit www.usfoodsovereigntyalliance.org. The US Food Sovereignty Alliance works to end poverty, rebuild local food economies, and assert democratic control over the food system. We believe all people have the right to healthy, culturally appropriate food, produced in an ecologically sound manner. 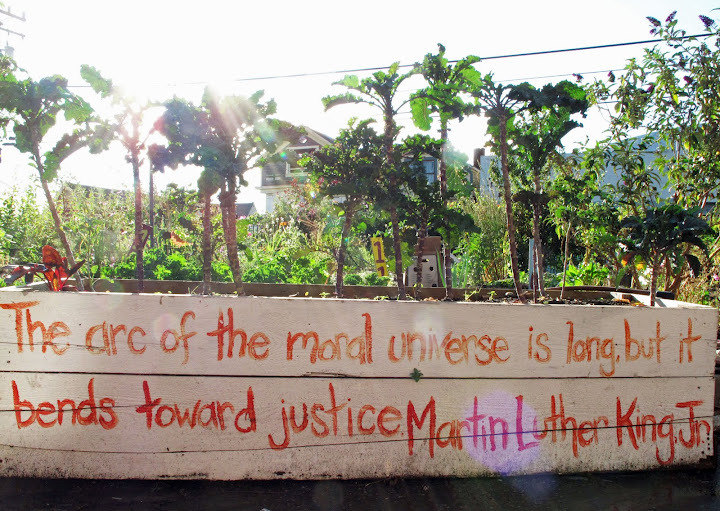 As a US-based alliance of food justice, anti-hunger, labor, environmental, faith-based, and food producer groups, we uphold the right to food as a basic human right and work to connect our local and national struggles to the international movement for food sovereignty. 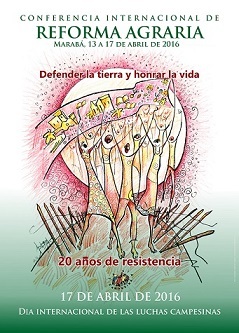 Images credited to La Via Campesina.